What’s up with celebrity babies? I mean, on the one hand, they have it all… born with silver spoons in their talons, their lives are full of privileges, luxuries, and freedoms that most of us could only dream of. On the other hand, they face a distinct set of expectations and challenging circumstances which none of us could ever relate to or truly understand. Except, of course, for all of you celebrities reading along at RFTNS. 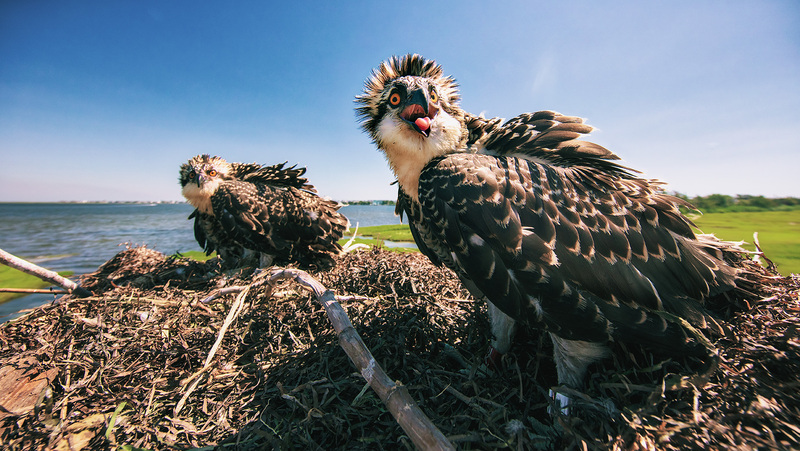 Whatever the case, LBI’s most famous and dysfunctional Osprey couple, Jack & Wendy of the LBI Foundation, have once again produced three gorgeous babies who have all successfully survived the LBI summer and grown to a reasonable level of maturity. What’s strange is that a few of them were still seen still hanging around their nest out back of the LBIF just last week. Are they spoiled and lazy? Or smart, and privileged? Hopefully as the cooler winds start to blow they will heed the call of migration and begin their mysterious and dangerous journey to South America. Thankfully for us, these babies became part of the elite club of Project Red Band and received their bright red, highly readable bands on their legs so we might know at some point in the future what happened to them, and what’s really up with celebrity babies. Osprey babies fly to South America where they will often stay for two years before returning to us. So it will be a while. Until then, godspeed you gorgeous, little, celebrity babies! Posted in Wildlife and tagged ben wurst, jack & wendy, LBI, lbi osprey, lbif, Long Beach Island, osprey. Bookmark the permalink. Great picture! Do they have names? Fabulously photo of lil’ monsters!